World-famous venues, animal attractions and wonderful woodlands; SoGlos has found 11 unique venues that promise a memorable celebration, in and around Gloucestershire. Check out 11 unique wedding venues in and around Gloucestershire. Catering for sports fans, adrenaline junkies, animal lovers and cultured couples, SoGlos has found 11 of the most unique and quirky wedding venues that the region has to offer. Encompassing everything from wonderful woodlands and tipis, to iconic sporting venues, be inspired to host a big day that’s a little different and a lot wonderful, with this hot list sponsored by Blackfriars Priory. Set in the heart of historic Gloucester, Blackfriars Priory is a 13th century venue with an abundance of charming character. Couples can choose from the North Range with its glorious glass windows, high ceiling and charming courtyard garden; or the East Range, which can hold up to 50 guests and forms part of the original Blackfriars building. For more information, visit gloucesterblackfriars.co.uk directly. 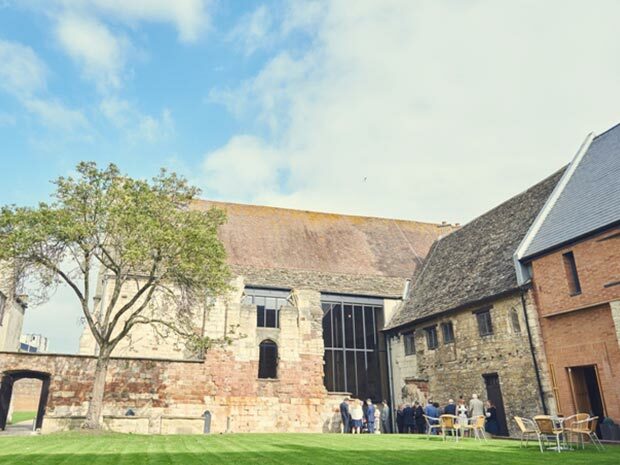 Breathtaking medieval venue, Blackfriars Priory in Gloucester is the perfect spot for an unforgettable wedding celebration and can host up to 200 guests. The 13th century site has been sympathetically restored to offer historical features, gloriously high ceilings and a spectacular space to celebrate your wedding day. For budding brides and grooms who love a bit of sporting entertainment, hosting their celebration at Beaufort Polo Club is a great option, with the added benefit of its secluded setting in the Cotswold countryside. There’s a host of special packages for couples, with the choice to host the wedding reception in The Beaufort Marquee, or have an intimate celebration in The Club House. With the chance to cheer on the polo whilst sipping on Champagne, it’s sure to be a big day to remember. One of the county’s most unique venues, Perrygrove Railway allows couples to tie the knot in the beautiful Forest of Dean setting; from the ancient woodlands to steam attractions, expect the wedding party to be wowed! Couples can choose from two characterful venues, with a number of distinctive finishing touches available; hire a steam traction engine, host a treasure hunt, or serve a traditional afternoon tea, for example. Nestled in 30 acres of picture-perfect woodlands, meadow and pastureland, and boasting panoramic views, The Wilderness Centre in Mitcheldean is ideal for nature-loving brides and grooms. With a friendly team that’s dedicated to bringing each couple’s dreams to life, the venue allows for flexibility, while the stunning surroundings provide a glorious backdrop for those all-important wedding photos. Animal lovers will be in their element with a wedding at Bristol Zoo; there’s the option to tie the knot in the elegant Clifton Pavilion; hold the ceremony striking Clifton Suite; or enjoy the evening reception in The Garden Room. Meanwhile with fabulous photo opportunities, newlyweds and their guests can take full advantage of the setting. Wander around the gorgeous gardens, explore the zoo and see a host of its resident animals. The jewel in jump racing’s crown and a world-famous venue – a wedding at Cheltenham Racecourse is sure to be a memorable day for the happy couple and their whole party. One of the largest wedding venues in Gloucestershire, and with a spectacular backdrop of Cleeve Hill, it’s the perfect setting for lavish celebrations and intimate parties; expect first-class catering, dedicated event management and a brilliant atmosphere. Ahoy there! Brunel’s SS Great Britain offers a versatile and unique space for saying those all-important vows; situated in the heart of Bristol’s harbourside, the venue allows for celebrations above and below deck. Brides and grooms can host their dream wedding on one of the world’s great historic ships, with stunning spaces including the Promenade Deck, the Weather Deck, and the Hayward Saloon below deck – perfect for dancing the night away! One of the UK’s most prestigious racing venues, Prescott Speed Hill Climb provides a backdrop that’s as iconic as it is beautiful. With panoramic views across the Cotswolds, the Clubhouse is perfect for wedding celebrations. Offering something pleasantly unique, the Clubhouse is home to a fully-stocked long bar, dance floor and terrace, allowing for alfresco drinks, soaking up the views, and hitting the dance floor. The University of Oxford’s museum of art and archaeology, the Ashmolean Museum dates back to 1683. Magnificent on the outside and fascinating on the inside, the versatile venue is perfect for a unique wedding. There’s a host of rooms and spaces for couples to hire, including the European Art Gallery which is home to incredible artwork and exhibits; and at the heart of the museum, the Atrium, a spectacular setting which extends from the ground floor to the full height of the building. A quirky café, bar and venue, The Cricklade Club is nestled in North Wiltshire, with its stylish function hall welcoming couples and their wedding party for a celebration to remember. Ideal for large wedding receptions, couples can dress the room as they wish; from the wedding breakfast through to dancing, the versatile venue allows for a wonderful celebration, whatever the theme of the day. Adrenaline junkies can combine their big day with exciting activities at The National Diving and Activity Centre in Chepstow; a Wire Zip Slide, Giant 3G Swing, and Flyboarding are options that are sure to make it a wedding to remember. What’s more the setting itself offers a unique charm; the on-site Water View Marquee has breathtaking views across the lake, while there are Wooden Wigwam Glamping Cabins for guests wanting to make a night of it.